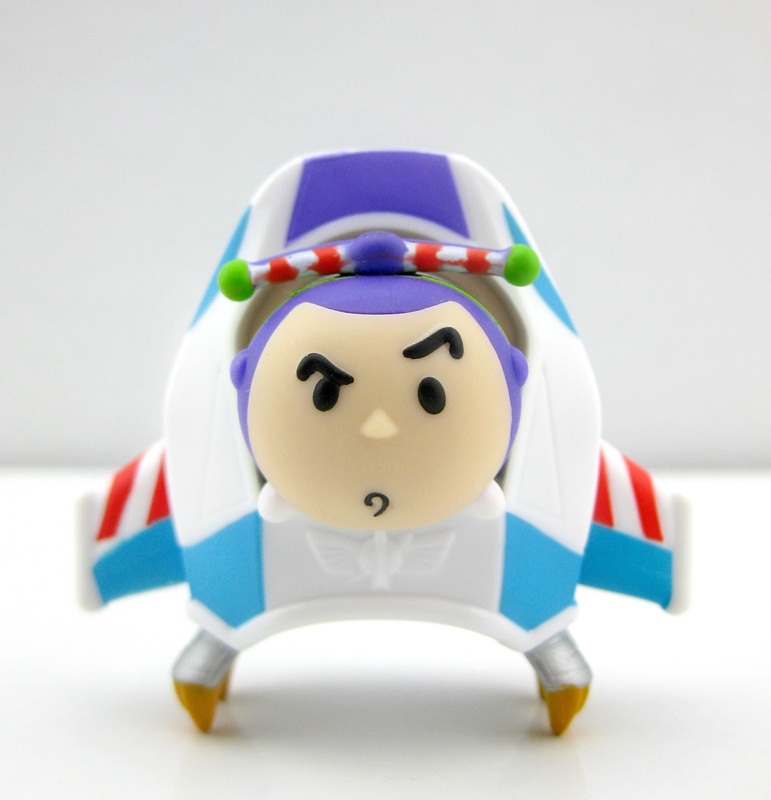 Hello Pixar fans! 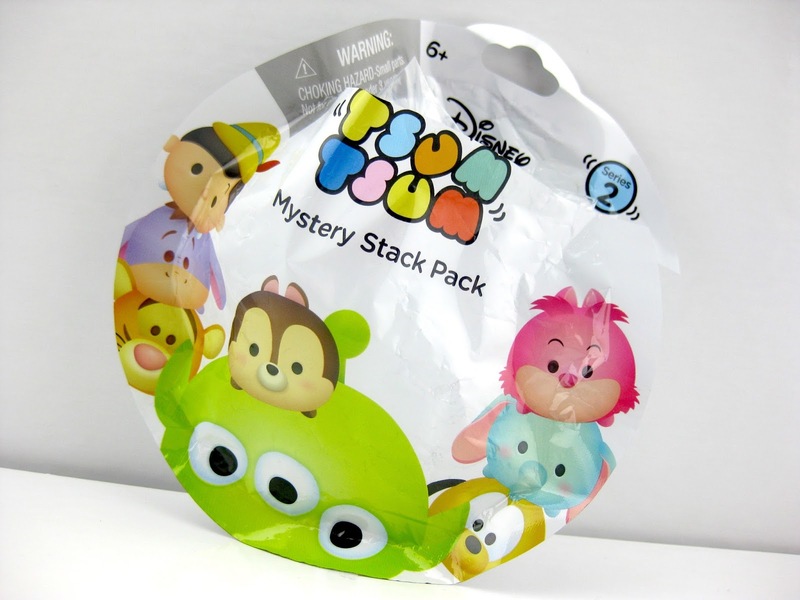 Over the next four days, I'm going to be taking a look at the Disney Tsum Tsum Mystery Stack Pack blind bag collection by Jakks Pacific...starting today with series two! 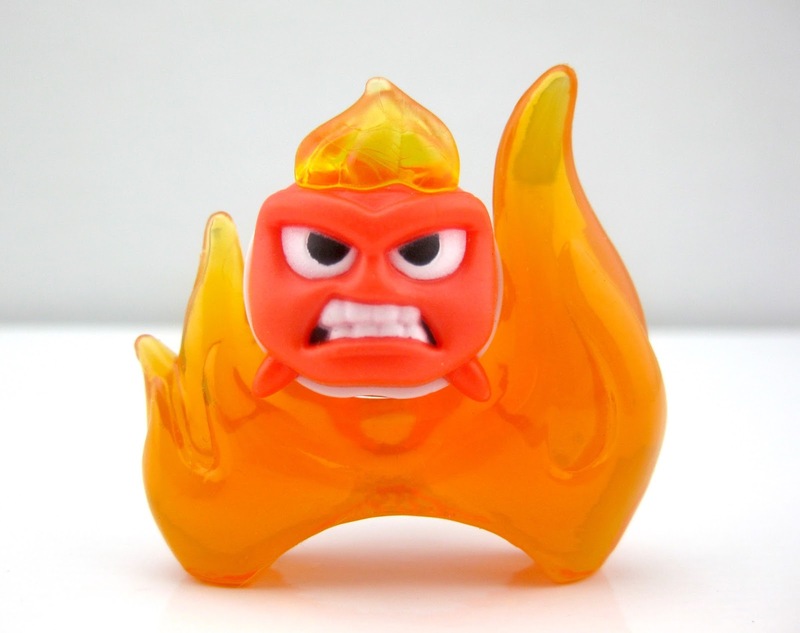 Of course I'm only collecting the Pixar inspired characters; so, since series one didn't have any, I'm moving right along. 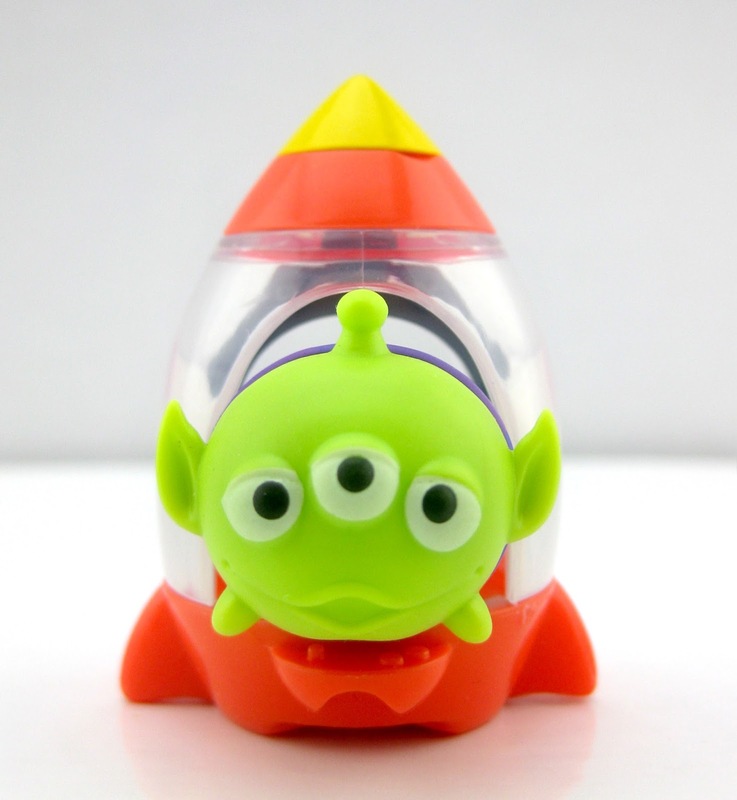 In series two here we have three Pixar characters: Buzz Lightyear and an Alien from Toy Story as well as Anger from Inside Out! 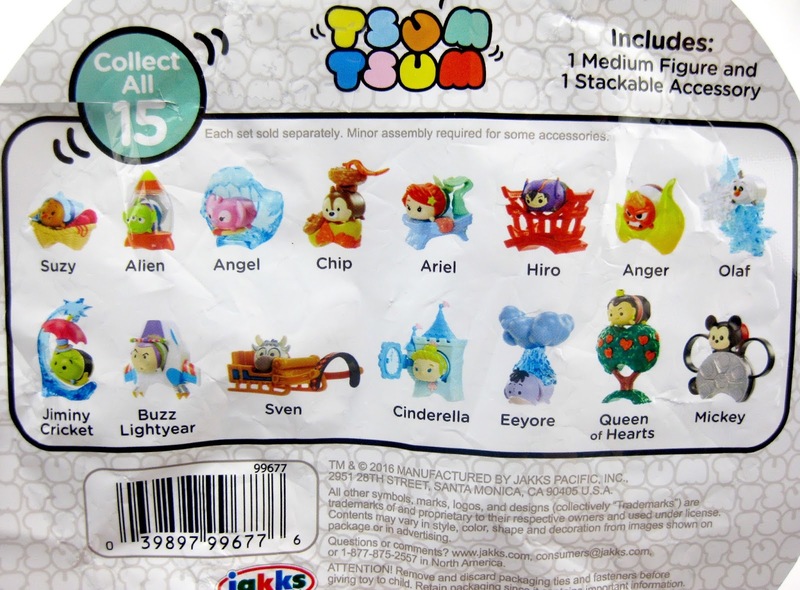 The other non-Pixar characters (as seen on the back of the package below) include Suzy, Angel, Chip, Ariel, Hiro, Olaf, Jiminy Cricket, Sven, Cinderella, Eeyore, Queen of Hearts and Mickey. Since this series arrived clear back in March last year, I had to resort to eBay for these three a few weeks back. I know I'm late in the game! But better late than never, right? 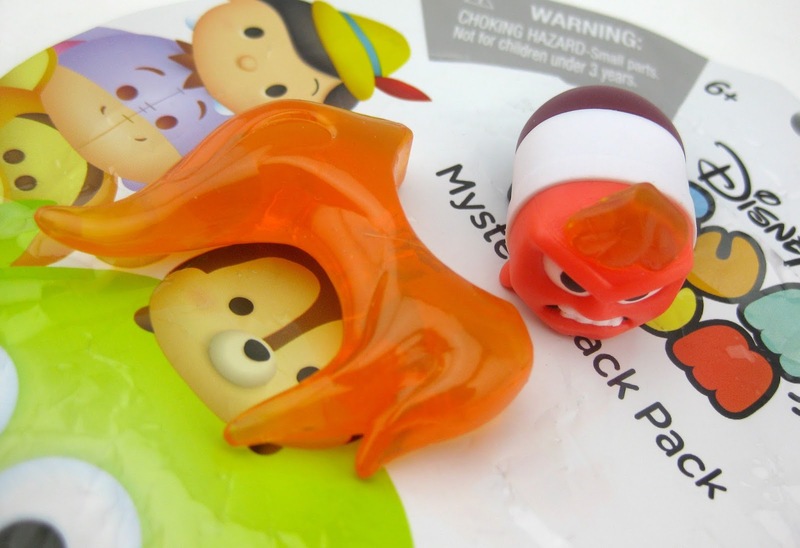 I've seen these blind bags on the shelves at Target, Walmart and Toy R Us stores for a long time now. I honestly never planned on collecting them (since I already collect the traditional Tsum Tsum mini plush), but, with the recent release of series five, I decided that these are just too fun and too cool to pass up. Though I'm just starting now, I was actually able to catch up pretty quickly. 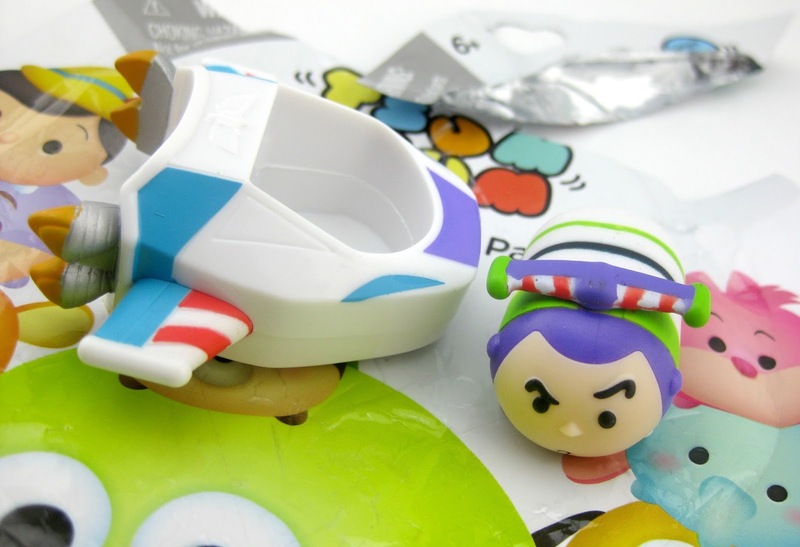 What really sold me on these blind bags was, not so much the little Tsum Tsum characters themselves (though they are pretty cute), but each one's little unique display piece/accessory. Those alone make these worth getting for me! 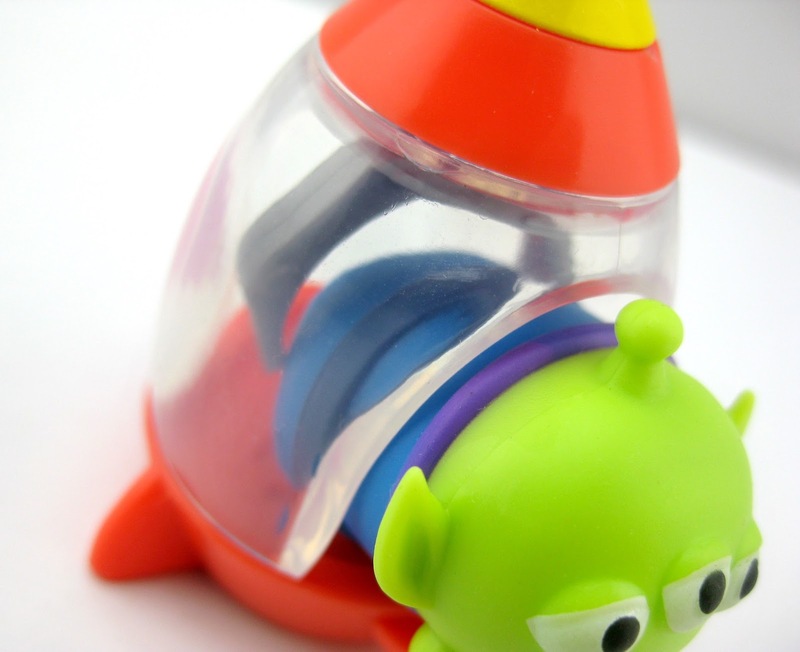 For example, Buzz comes with his spaceship, the alien comes with a claw machine and Anger comes with flames to sit on. In my opinion, the accessories get progressively cooler with each new series. 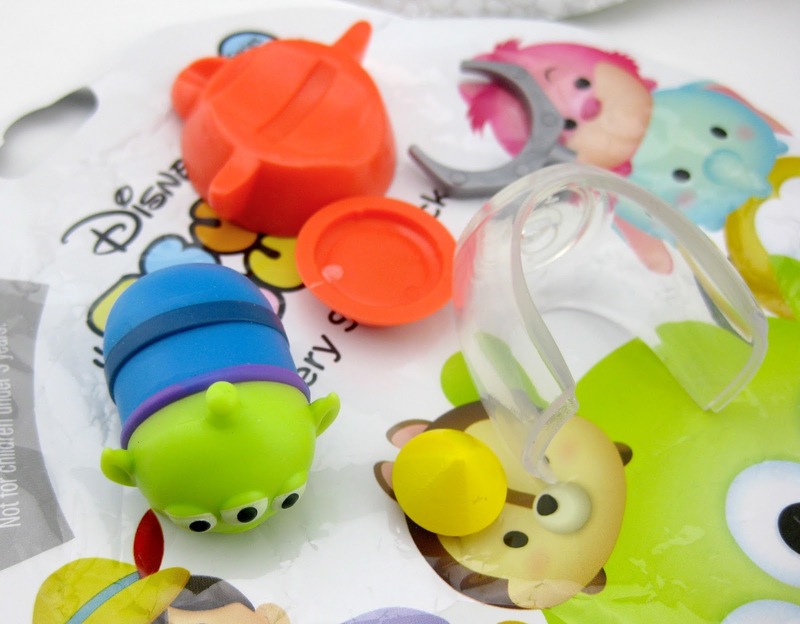 Each tiny Tsum is about 1.5" in size and is made of a soft vinyl/plastic material (the accessories are more of a harder plastic). Each pack retails for $2.99. I like how some of the more elaborate display stands have multiple pieces and have to be assembled. The claw machine has to be one of my favorites! 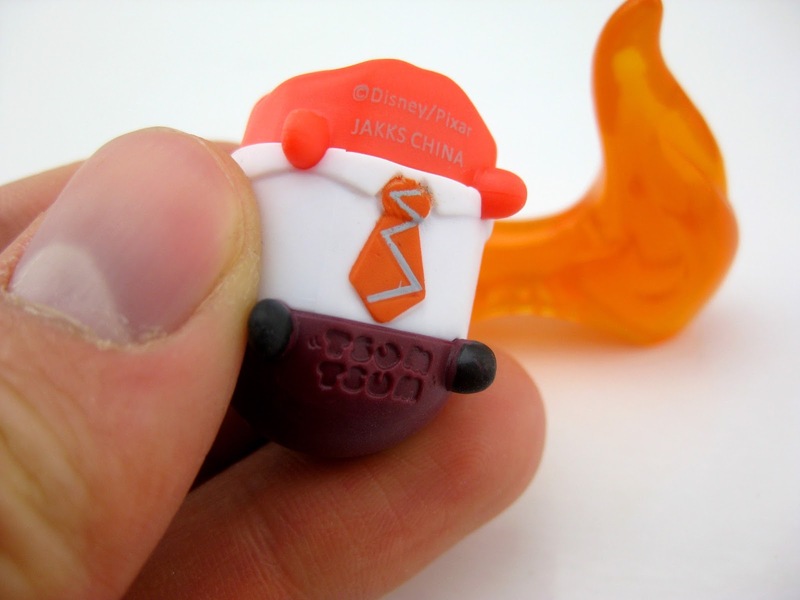 Jakks Pacific also makes [non-blind] three packs and nine packs of these little plastic Tsums (featuring many more characters in a variety of different sizes), but they don't come with any display accessories. I'm personally gonna pass on those and just stick with these mystery packs (to keep things simple), but I wanted to throw it out there in case any of you were interested. 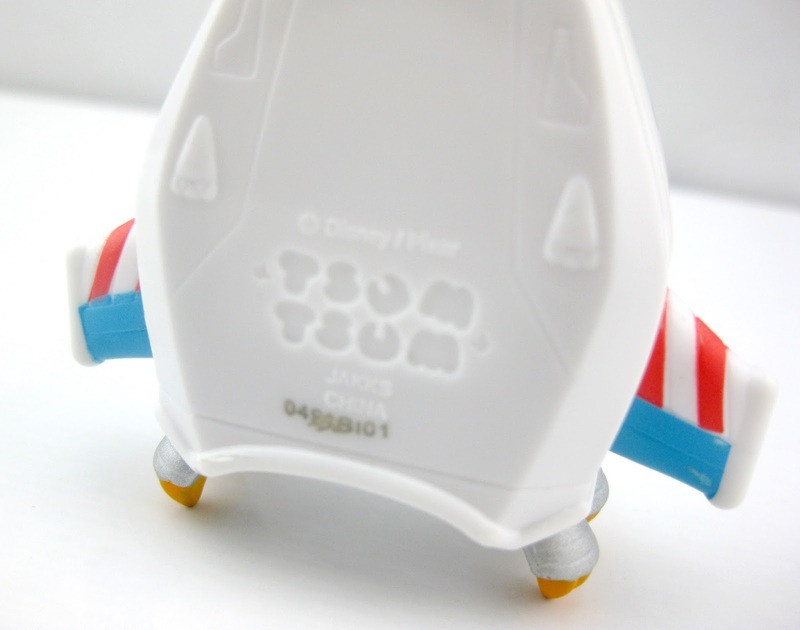 I also wanted to note that all the Tsums of varying sizes, as well as all the accessories, are stackable. If you're looking to track any of these down at this point, checking current eBay listings HERE is your best bet. Video Unboxing Update: Ratatouille Funko "POP!"